Will Uber compete with transit in more developing countries? 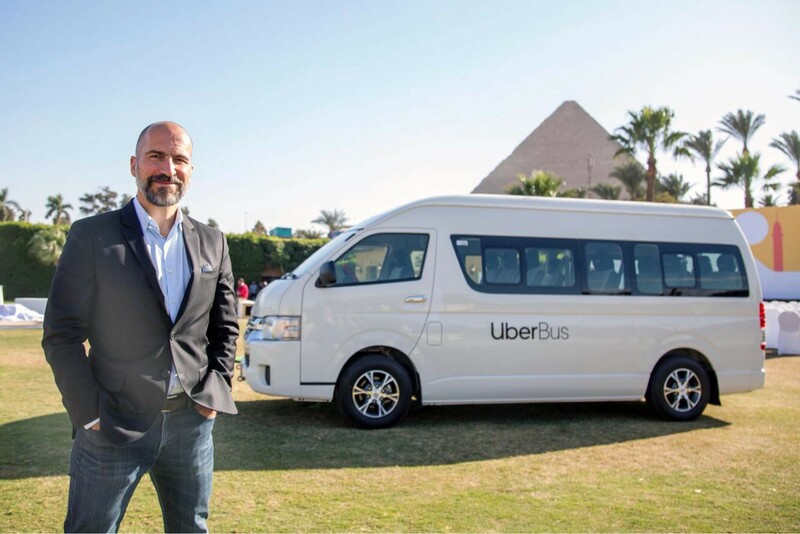 CEO Dara Khosrowshahi was in Cairo on December 24 to officially launch UberBus, the company’s new minibus service. Unlike its UberX and uberPOOL offerings — the latter of which isn’t available in Egypt — UberBus will run two fixed routes through Cairo and customers will only be able to request a ride if they’re in one of the neighborhoods being served. It was over a year ago that I first wrote about Uber’s intentions to launch its fixed-route bus offering, and Khosrowshahi admitted it was something the company was thinking about back in February, telling a conference, “I want to run the bus systems for a city.” The delay may have been due to a ban of Uber and Careem that the companies had to fight off earlier this year. However, in that year the company’s strategy has changed significantly from a focus on self-driving vehicles to developing a transportation monopoly through its app. Egypt was one of the company’s fastest growing markets in 2017, so much so that it opened a $20 million operations center in the North African country to support its growing African presence. However, the Uber bus network was originally conceived as a way to expand the service into other parts of Egypt, yet this announcement is only for Cairo. Outside the capital, Uber only operates in the Mediterranean port city of Alexandria. There don’t seem to be any current planned expansions, but that doesn’t mean UberBus won’t be a core part of Uber’s future strategy. A bus service to take on public transit works even better within its new vision, and many developing countries like Egypt are the perfect places for such a service. Transit networks in the developing world are often much weaker than those in the developed world, even though they’re expected to serve far more people in fast-growing metropolises, leaving an opening for a company like Uber to exploit. Before diving into what UberBus means for the company’s larger strategy, it’s worth looking at what it means for Cairo. It’s not a stretch to say that residents of Cairo are underserved by their transit system. The city has a three-line metro that is undergoing a long-overdue expansion and could grow to six lines in the coming decades. It also has conventional bus routes, as well as plenty of minibus options. But if you’ve ever been to Cairo you know how congested the streets can get, which is why I’m still skeptical of how much UberBus will really help. At best, UberBus adds a more convenient service for those in Nasr City in the eastern part of the city, and Dokki and Mohandessein on the western side of the Nile. I’ve included the Westbound UberBus route map — the stops on the Eastbound routes are the exact same — and a map of Cairo’s metro with the approximate UberBus stops added. 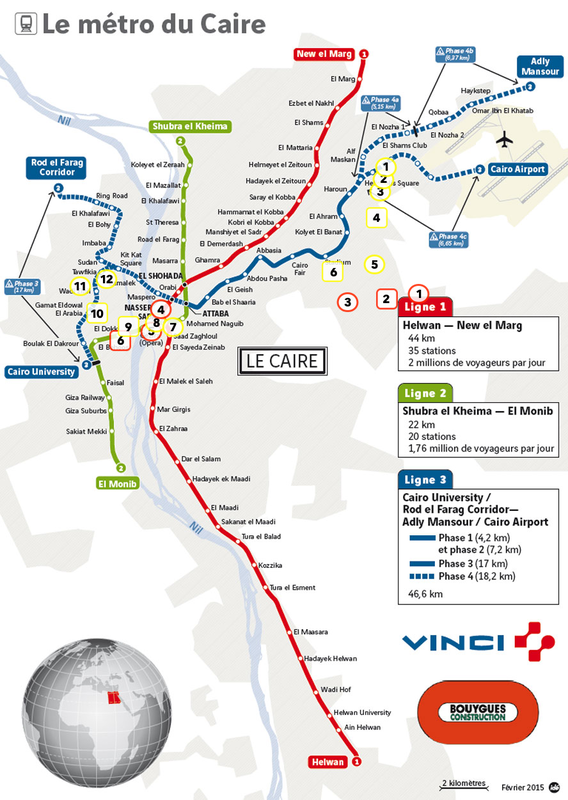 Line 3 of Cairo’s metro, indicated in blue on the map, is currently operating from Attaba, which connects to Line 2, to El Ahram, but the section from El Ahram to El Nozha began testing in October and is due to open in December 2018. The further eastward extensions to Adly Mansour and Cairo Airport are due to be completed by the end of 2019 (pdf), and the westward extensions across the Nile are due to open in stages between 2022 and 2023. 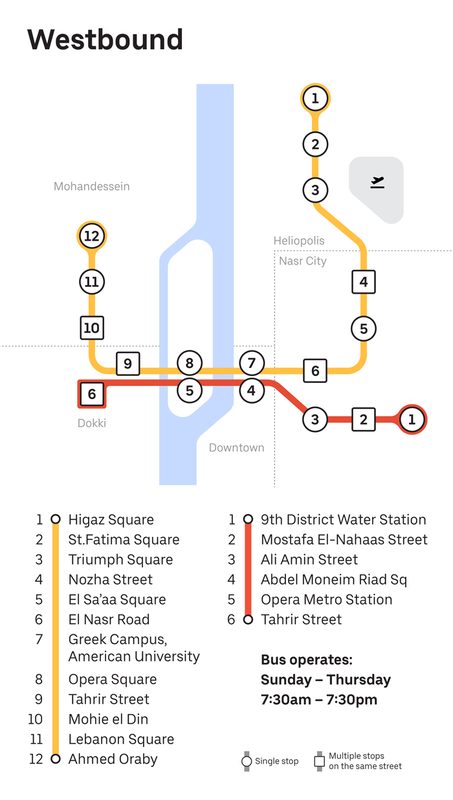 Looking at the map, the only service offered beyond the metro — in areas which are already served by regular buses and minibuses — are stops 10–12 on UberBus’s yellow route which will be connected to Line 3 in 2022 and stops 1–3 on Uber’s red route in Nasr City which will be served by Line 4 (not on the map). I can’t find a solid date as to when Line 4 is scheduled to open, but it looks like the contracts for its first phase were awarded earlier this year. Stops 1–3 on the red route are close to City Stars, a major shopping center. UberBus may be air conditioned and easier to predict than a bus or minibus, but it will still get stuck in traffic like anything else on the street. Will it even be affordable? In July 2017, metro fares were hiked from 1 Egyptian pound (LE) to 2 LE, and in May 2018 they were raised to between 3 LE to 7 LE ($0.17–0.39), depending on the number of stops. The prices for buses and minibuses seem to range from 1 LE to 5 LE ($0.06–0.28). In contrast, fares for UberBus can be much higher. A trip from Nasr City to Mohandessein is advertised for 19 LE ($1.06) on their website, while Mohandessein to Tahrir Square in the center of the city (stop 7 on the yellow route) would be 10 LE ($0.56). Those prices aren’t outrageous; they’re a bit of a savings for regular Uber users, but they would be a premium for people currently using the metro or existing bus and minibus services. UberBus is not going to take over Cairo tomorrow, but it does give it a foothold in the transit market with a more premium service for those who can pay for a nicer ride. It won’t relieve Cairo’s transit needs, and it seems unlikely to entice more people to use communal transport modes. UberBus will still get stuck in traffic, the metro will remain the best way to go long distances, and if UberBus lures people off the metro with the promise of greater comfort, the city’s congestion problem will only get worse. When the idea of an Uber bus service was first floated, Khosrowshahi had not long taken the reins from disgraced co-founder Travis Kalanick. The company was still wedded to Kalanick’s plan for self-driving cars to replace human drivers to achieve profitability — a plan that was destined to fail. Khosrowshahi brought new ideas, and after the fatal crash in March when a self-driving Uber vehicle killed a pedestrian, he pushed his new vision. In Khosrowshahi’s eyes, Uber should become the “Amazon for transportation” — a monopolistic platform that dominates the transportation industry and is the app everyone turns to when they need to get from point A to point B. Uber has expanded its ride-hailing options to include uberPOOL, a cheaper option where rides are shared, and it looks like UberBus could be its version of POOL in developing countries. Uber also acquired Jump Bikes earlier this year to expand into dockless bike and scooter services, and it has ferry, motorbike, and other services in select markets around the world. However, in order to make its app more attractive, it’s also signed agreements to add Lime bikes and scooters, Getaround car rental, and Masabi public transit ticketing options. There’s even rumor that Uber could soon acquire Bird, a leading scooter service. Uber’s plan to become the dominant trip-planning app and service provider within it relies on both of these approaches. It needs the third parties to attract customers with more options, and it can conveniently get their trip data that way as well. But by providing its own services, it can direct users to them as it chooses, and it can use the third-party data to instruct its service expansions, just as Amazon has done to its third-party merchants. There’s one other important takeaway from UberBus: what it suggests for microtransit. Some technologists have been pushing on-demand buses and minibuses as the future and arguing they would be better than existing fixed-route public transit. However, Uber’s decision to launch its own fixed-route service proves that even the biggest tech-transportation company thinks that’s a bad idea. Fixed-route transit is still king, be it in the United States or Egypt. UberBus fits well into Uber’s plan to offer more services to make its app more attractive. It’s designed for developing-world megacities which are underserved by transit, and could well expand to more in 2019. But, for the moment, UberBus is not serving the underserved; it’s focused on providing a more comfortable ride in places that are already well served, and isn’t going to do much to solve congestion. For that, metro expansions and proper large-scale transit systems will be the only investment that will yield results.